West of England Water Softeners cover the Corsham area. Corsham is in the west of Wiltshire surrounded by countryside and has a population of around 10,780. Corsham, during the Second World War, became a major administrative and manufacturing centre for the Ministry of Defence, making use of the old quarry tunnels and the MoD still remains a large presence in the town. The Great Western Railway’s main line passes through Corsham, connecting up London to Bristol, Exeter and Penzance. Corsham is home to ‘Octavian’, a self storage facility for the maturation of fine wines; the cellars are approx. 200 feet underground and used to be an old Wiltshire mine that mined limestone. Corsham has a stately home, Corsham Court, which is found in the town centre and its resident peacocks can often be seen wandering about the town. The outskirts of Corsham include the idyllic surrounding villages of; Neston, Whitley, Atworth, Shaw, Lacock, Notton, Biddestone, Slaughterford, Colerne, Ditteridge, Box, Giddeahall, Lanhill, Ford, the local towns of; Warminster, Frome, Melksham, Trowbridge, Westbury, Bradford-on-Avon, Calne, Devizes, Royal Wootton Basset, Malmesbury, Marlborough, Midsomer Norton, Radstock and the beautiful Georgian city of Bath. Corsham is in a very hard water area, it is estimated that only 53% of households in the UK live in a soft water area. Hard water is a build up of calcium and magnesium carbonates which is the limescale in your water. A common way to soften water is by using ion exchange resins, this process of softening hard water is done through a water softening system called a water softener. West Of England Water Softeners Corsham (W.E.Softeners Ltd) can help you choose a water softener to suit your requirements. We are an Authorised Kinetico Dealer based in Holt near Trowbridge, on the B3107 between Melksham and Bradford-on-Avon. Our most popular model is the Kinetico Premier, non-electric, salt block water softener which will remove the limescale from your water. However, we can also supply electric water softeners and are able to repair and service many makes of water softener. West of England Water Softeners Corsham have been softening water for more than 50 years, also providing drinking water systems and supplying water softener salt in Corsham including, tablet salt, granular salt and block salt for water softeners in Corsham. 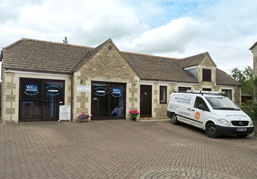 We provide a water softener salt delivery in Corsham or salt can be collected from the large salt supplies held at our showroom and offices in Holt. As an authorised Kinetico dealer WE Softeners are able to offer and extensive range of water softeners. We stock spares and can repair most makes of water softener and would recommend the Kinetico Premier water softener for homes in Corsham as it is a twin cylinder block salt non-electric water softener and gives continues soft water, even whilst regenerating. This is ideal for homes in Corsham as the water is very hard. Salt blocks, salt tablets and granular salt can be collected from our premises or delivered depending on your address and size of order. Please call for more information. Water softener salt types and salt blocks for softeners. 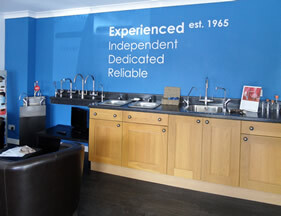 Visit our showroom for an in store demonstration where you can also view the extensive range of water softeners including the Kinetico Premier twin cylinder block salt non-electric water softener, the Mach Series 2050 compact water softener a non-electric twin cylinder high performance conditioning system, a selection of electronic single cylinder timed or metered softeners. Drinking water systems including the Aqua Scale 9000, Aqua Taste 7000, Aqua Guard 7500, the K5 reverse osmosis system, also water filters and cartridges. Alternatively arrange for a free home visit to include a soft water demonstration, water hardness test together with a water pressure check and site survey for the installation of a water softening system. When you have chosen the best solution for you, we offer a full installation service to the Corsham area, and when you need to replenish your water softener salt, you can collect salt fir your water softener from our offices in Holt arrange a delivery. Our qualified plumbers and factory trained engineers can install service and maintain water softeners including Corsham. Also we stock spares and can repair most makes of water softener including Permutit water softeners, Aqua Dial water softeners, Monarch water softeners, Culligan water softeners, Avon Soft water softeners, Zephyr water softeners, Euro water softeners, Domextra water softeners, Autotrol water softeners, Fleck water softeners and many others.